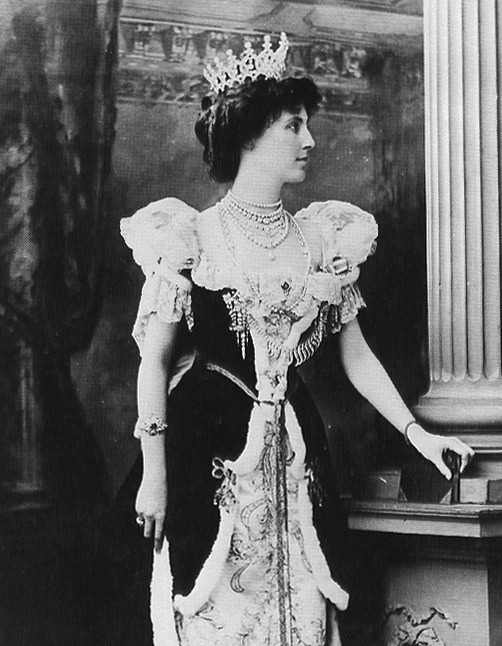 Distressing jewelry news out of England this week: the Portland Tiara, one of the pieces most prominently worn during the 1902 coronation, has been stolen from the Welbeck Estate in Nottinghamshire. The tiara has a rich royal history. In 1901, when Queen Victoria died, Britain prepared for its first coronation in more than half a century. 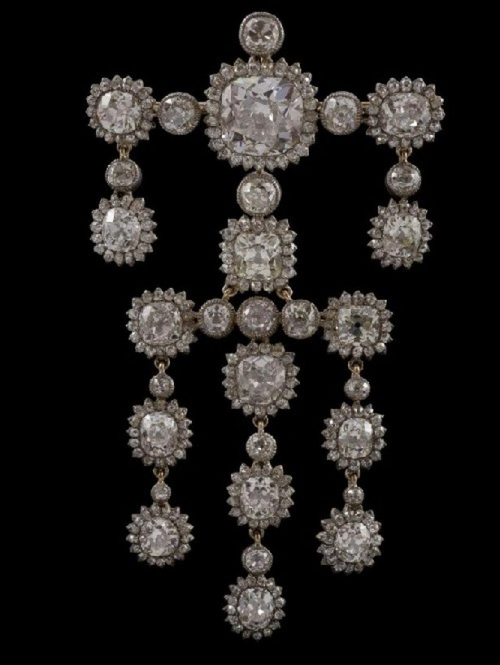 Many aristocrats, including the 6th Duke of Portland, ordered new jewels for the occasion. He commissioned Cartier to make a new tiara for his wife, Winifred, to wear at the coronation in Westminster Abbey. The centerpiece of the tiara would be a rectangular gem, the Portland Diamond, from the family's collection. Winifred had been given a special role at the coronation that certainly warranted a brand-new tiara: she had been named as one of the four duchesses who would serve as canopy bearers, surrounding Queen Alexandra as she was anointed. The new tiara, therefore, would have a special place in the spotlight -- and it would be captured for posterity by the artists producing special paintings of the coronation. 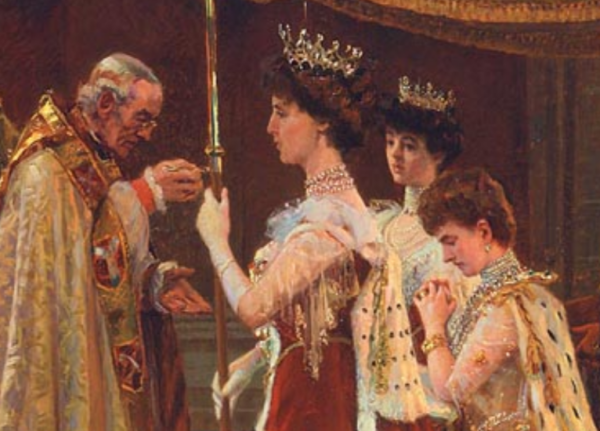 Winifred and the Portland Tiara, with its distinctive curves and scrolls, can be seen clearly in Laurits Tuxen's painting of the anointing of Queen Alexandra. 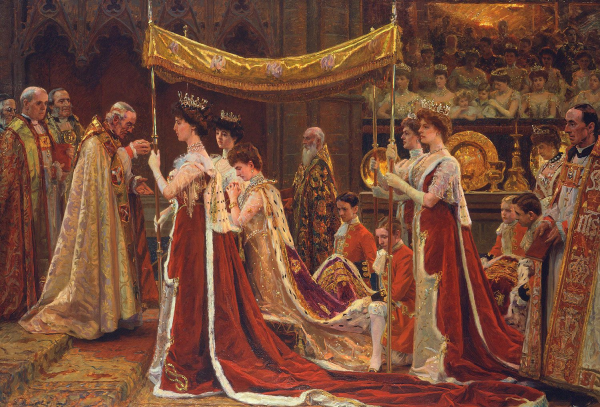 This detail from the painting depicts William Dalrymple Maclagan, the Archbishop of York, preparing to anoint the kneeling Queen Alexandra, with Winifred in the foreground (wearing the Portland Tiara) and the Duchess of Marlborough in the background (wearing her diamond tiara from Boucheron). The other two canopy bearers, the Duchesses of Montrose and Sutherland, can be seen in the full version of the painting above. The original version of the tiara was topped by a series of diamond clusters, which were later removed and repurposed as a brooch. That brooch, seen above, was also stolen on November 20. You can spot the clusters atop the tiara in this portrait photograph of Winifred, taken around the time of the coronation. The new tiara continued to be useful throughout her life, including her time at court as Queen Alexandra's Mistress of the Robes. 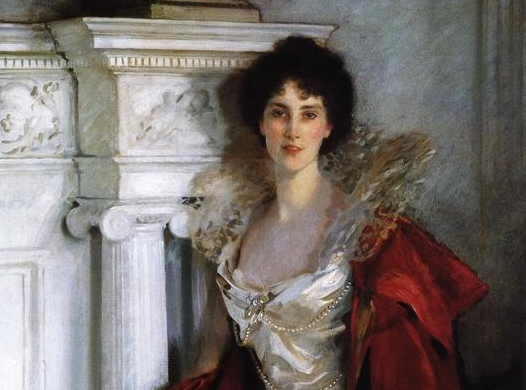 Although some of Winifred's jewels were auctioned after her death (including her sapphire tiara), the tiara remained with her descendants -- until it was stolen this week. The tiara and brooch were housed in a gallery on the Welbeck Estate, which was the seat of the Dukes of Portland for centuries. (The title went extinct in 1990.) Thieves broke in to the gallery on the evening of Tuesday, November 20, smashing the alarmed glass case where the jewels were kept and speeding off in a silver Audi. The car was later found abandoned in Blidworth. Police are hoping that anyone with information about the crime will come forward, and the Welbeck Estate website currently includes a press release with contact information from the authorities. 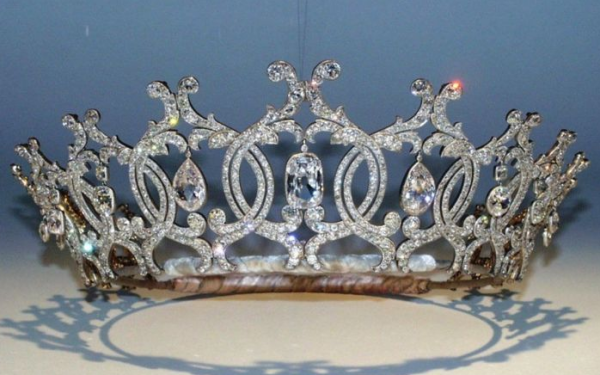 The tiara is, sadly, only the latest in a string of prominent jewels to be stolen from museum collections. In April 2017, a diamond tiara from the collection of Grand Duchess Hilda of Baden was stolen from the Badisches Landesmuseum in Karlsruhe. And in August, a group of thieves sensationally escaped by boat after stealing pieces of Swedish royal funeral regalia from Strängnäs Cathedral. Neither theft has been solved.